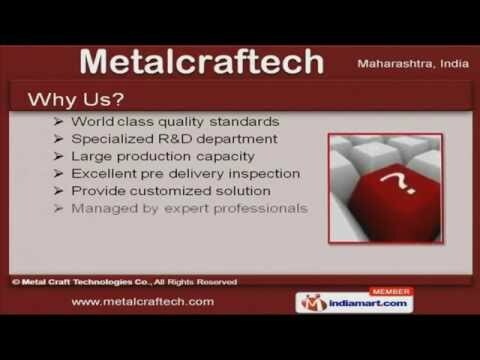 Welcome to MetalcraftechManufacturer & Exporter of Industrial Processing MachinesThe company was established in 2001, at Chennai. We Serve to Chemical, Pharmaceutical, Textile & other industries. World class quality standards, large production capacity & excellent pre delivery inspections arethe factors which make us a preferred supplier in the industry. Our product list covers Micro Pulverizer, Ribbon Blender, Industrial Filter & GranulatorMachines. Chemical Centrifuge, Bag Lifting Type & Driven Bottom Discharge Centrifuge are the types ofCentrifugal Hydro Extractors that we offer. We offer Micro Pulverizers that are easy to operate and serve the needs of different industriesfor long period of time. Our Industrial Filters & Ovens are highly efficient. Ribbon Blenders & Reactor Vessels offered by us are well known for their outstandingperformance. Along with that we offer Granulator Machines that are best in the industry.